The Substance Abuse Program utilizes a comprehensive cognitive-behavioral treatment model. This model uses motivational interviewing techniques to move youth along the stages of change spectrum to achieve their goals. The ultimate goal of the program is harm reduction; youth make weekly goals to reduce their usage over a three month period of time. Sessions include an assessment, education on the dangers and social and legal consequences, identifying triggers and points of vulnerability, identifying values, understanding their feelings of anger, anxiety and fear, breaking the cycle with self-awareness, managing peer pressure, learning new decision making skills, identifying their support system, learning how to keep life in balance, coping skills for emergencies, relapse prevention and establishing a safer environment, learning how to handle uncomfortable thoughts and feelings, addressing problems with authority, seeking happiness and contentment, goal setting, healthy relationships and healthy boundaries, avoiding old relationship and family traps, avoiding relapse and instilling safety nets for the future.This program is comprised of twelve individual sessions; each session is approximately one hour in length. Additional sessions may be added to accommodate the youth’s needs. Choose the right time to talk- talk with your child in private during a quiet part of the day when you won’t be interrupted. Make sure you are calm and prepared, make sure you create an open and inviting conversation where they feel safe and will be honest with you. Knowing the general whereabouts of your child at all times, especially when school is out for the day. Its simple: The more effective monitoring and supervision of children the lower risk of their drug use. Proper parental monitoring includes being aware of the activities in which your child is engaged and also being present during recreational events such as school activities. For many that is simply possible, but you can combat that by expressing your desire to attend these events to your child and telling them that you wish you could be there. Children imitate not only healthy behaviours but also unhealthy behaviours. This includes drug and alcohol consumption. One way to model healthy adult drinking behaviour for your teen is by consuming small amounts of alcohol with a meal or under celebratory circumstances. By modeling this type of behaviour, your child will see you drink in a moderate way, without extremes, and not as a negative coping strategy when you’re angry, tired, stressed or sad. Speaking in an open way about alcohol is another healthy modeling behaviour. Modeling openness can strongly influence your child’s attitude. Talk openly with your child about your own drug use of alcohol and let your child talk freely about the use of drugs and alcohol he or she has seen and any opportunities to use he or she may have experienced at or after school. This allows you to “be in the know”, by talking about yourself first it takes the pressure off the youth. It is very important not to glamorize drugs and alcohol and make it something they want to try. Another area where it is important to model healthy behaviours is while regulating emotions and reactions to stress. These behaviours are indirectly linked to drug use. How you, as a parent and adult, cope with stressful situation or manage your emotions is visible to a child. Your child will learn to express stress and emotions by witnessing your behaviours. A close relationship will make it easier and produce less conflict when the time comes for you to monitor your child’s behaviour and selection of peers more closely as the child ages. Children who have warm and supportive relationships with their parents are less likely to engage in drug use. As a result, it’s especially important to establish a close relationship with your child early on in his or her development. Studies have shown that weak parent-child bonds or early parental rejection begins a negative cycle of parent and child interactions. For older teens, maintaining a closeness remains important. Some research study shows that a close relationship will make it easier and produce less conflict when the time comes for you to monitor your child’s behaviour and selection of peers more closely as the child ages. If your relationship with your child has been stormy for a long time, it’s never too late to start a closer, more intimate and supportive relationship. Your child may have some ideas of his or her own on how to build such a relationship. Talk to your child and engage him or her in building a living a relationship that everyone in the family can be happier with. It is important to set boundaries and rules for your child to follow that they know you will implement and are serious about. Positive and Supportive behaviours such as hugs, small talk, pro social modeling of behaviour, other social interactions not revolving around substances are essential. It is important to provide information to their children about the health and safety risks of drug use. As a parent or guardian, you need to keep yourself informed about new drug trends. You want to avoid your teens picking up their education from the internet or MTV. Research shows that 2 things happen when parents respectfully express disapproval of alcohol and other drug use: There is a decrease risk of using Or There is a reduced likelihood that the teen will transition from experimentation to more regular or heavy drug use. A child’s peer choices are often influenced by the very nature of the parent or parents’ relationship to the child. Research has shown that a teenager is more likely to affiliate with deviant and drug-using peers when the parent-child relationship is highly characterized by conflict. Here are some practical strategies that may help you maintain awareness of your child’s peer relationships; Engage in light conversation about your child’s peers (such as what activities they like, what their personalities are like, ect). Share information about your own friends and peers. Have direct conversations with your child’s friends (an opportune time to a have these conversations is in a car, so if possible, offer to transport their friends). Discuss the importance of peer choices and the role these choices play in social acceptance. Encourage your child to recognize and intervene when a friend might be having difficulties. Establish communication with the parents of your child’s closest peers in order to understand whether their household roles are similar or different, particularly regarding their attitudes and rules on providing alcohol to minors within the household. DO Try to remain cool and calm. DO Talk to them and try to find out what they have taken. DO Call a doctor or take them to the nearest hospital emergency department if they are seriously ill.
DO Tell them, “We will talk about this tomorrow”. DO Check on them often during the night if they are in a condition to be sent to bed. DO NOT Shout at, accuse or hurt them in any way. All this is quite useless and harmful when they are in this condition. DO Talk to them immediately. DO Have them assume responsibility for their actions including clean up. DO Let them know you will not accept their behaviour and you will be watching them closely in the future. DO Set up guidelines for behaviour with your child as well as curfews for going out with friends. Let them know you expect them to follow these guidelines. DO Talk with them about other activities and choices, so they can avoid taking drugs. DO NOT Have your discussion with them if you are too angry to talk about it without losing your temper. Wait until you can discuss it calmly. No one gains from angry words. When you talk to your teen, stay calm, tell them you care about them, stay focused on the facts, tell them what your concern is, what you saw occurred, how it made you feel. Then Listen to them. 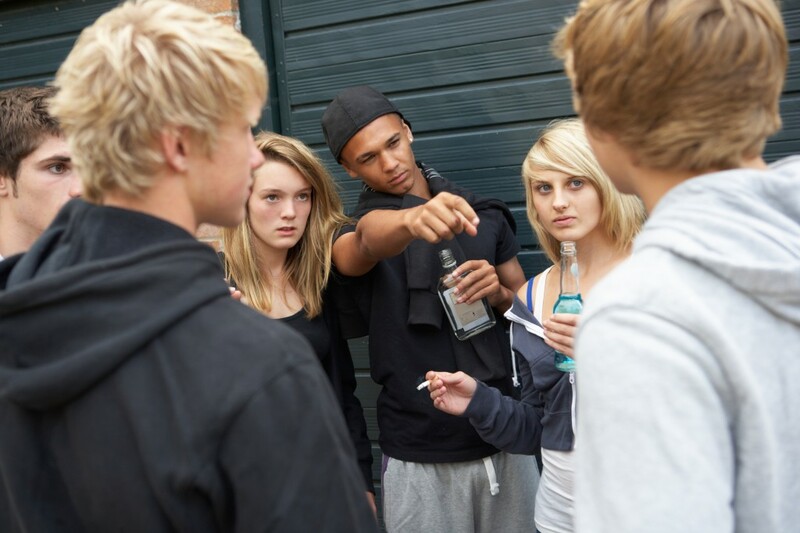 After listening tell them what you want to see happen with their drug/alcohol use and set limits and consequences.